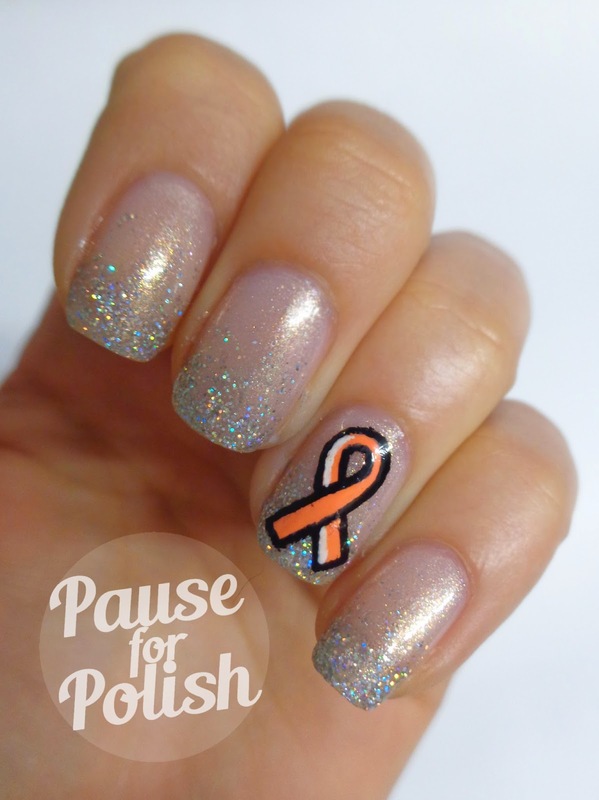 So today's manicure is one that means a lot to me, and I think it's fair to just warn you this is an in depth and honest post, discussing something that can be a sensitive issue. 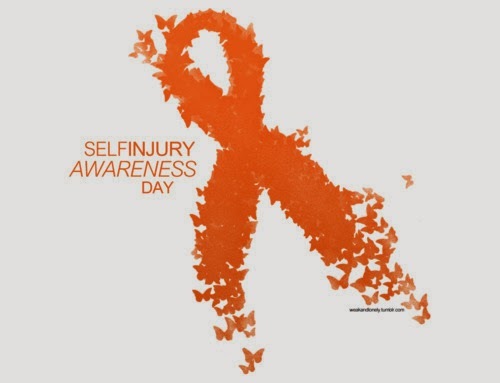 For those of you who didn't know, yesterday was Self Harm Awareness Day. To promote this, every March 1st people wear an orange ribbon, write love on their arm or draw a butterfly somewhere on their skin. 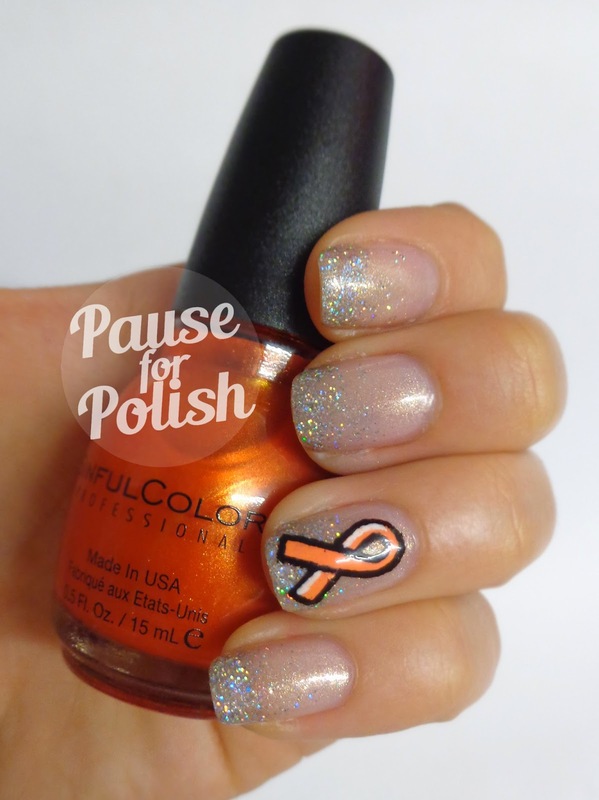 I chose to wear an orange ribbon and butterfly on my nails. If you'd just like to see the manicure then that's absolutely fine, but I really wanted to share a bit of my story with Self Harm with you all. If you are interested then just scroll down past the photos to read it, I appreciate anyone taking the time to do so. I was hoping to post this yesterday, but after a hard day at work I didn't feel like what I was writing was coming out how I wanted it to. I've never really had the opportunity or platform to be able to express my views and personal story when it comes to SH, so I wanted to get it right. If you find this topic sensitive then please don't feel like you have to read this, but the whole point of March 1st is to spread awareness and support so that's what I'd like to do. There are many different forms of self harming, the most well known is obviously cutting or burning the skin. You could also argue that eating disorders, over dosing or even purposely putting yourself in risky/dangerous situations as a way of injuring/abusing yourself. Although I have hurt myself in many ways; burning, scratching, hitting myself and overdosing, it's cutting that has been the constant coping method in my life. In September of this year, it will be 8 years since I first picked up a blade and made the decision to use it on myself. There was a build up to this, scratching my skin until it was raw for several weeks beforehand. I still to this day couldn't tell you why, and what possessed me to want to do it. I was just a scared, confused and extremely unhappy 13 year old. I couldn't understand how everyone was so happy around me, yet I had this constant battle inside me every single day. Don't get me wrong, I had a good childhood. I didn't suffer from any major health problems, I was in all the top classes, I had a loving family and I'd like to think I had many friends as well. But nothing could get rid of the pain I was feeling inside, until i started to cut. It started out as light scratches, once, maybe twice a fortnight. For a year I hid it from everyone I knew, wearing long sleeves and jeans in the summer, flinching away from people's touch. But as my depression grew worse, so did my self injury. It was in year 10 of school that my life really started spiraling downwards. At a time I should have been focusing more than ever on school, I was too busy skiving lessons, 2 or 3 times a day, to hide in toilet cubicles cutting myself. I used whatever I could get my hands on; glass, mirror shards, scissors, wire, nails and of course razor blades. I'd wear a wristband on my left arm every day with a blade tucked in, just in case. I ran out of room on my arm, eventually spreading to the right one.. Then to my thighs, legs, upper arm and even my stomach. At this point, everybody knew. Unsurprisingly a bunch of 13 and 14 year olds aren't very understanding, to say the very least. I was bullied every single day, causing me to cut even more which just fed their hate and caused a vicious circle to form. Nobody could understand why I was doing it, and they found it easier to throw abuse at me than to talk to me, or just leave me to it. Even the teachers didn't know how to handle it. Every now and again I'd get pulled to one side, asked if i was okay, assured that I could always go to them to talk if i needed to. But it meant nothing to me, because all i'd ever hear is 'You have to stop.' I knew full well the entire time my behaviour wasn't normal, and I was more depressed than ever, but stopping never crossed my mind. I was asked to see the school counsellor, as well as the Connexions advisor and a lady called Mrs Packer who would often just sit with me on particularly bad days. Nobody knew what to say to me, and half way through year 11 it seemed everybody had given up. I stopped seeing my counsellor, he felt he wasn't able to help me anymore, and that I should start seeing somebody more qualified who could suggest medication. Needless to say, that was quite a blow. At this point I barely had any friends left, and I can't say I blame them now. I was drinking at school, taking ridiculous amounts of paracetemol or anything I could get my hands on. I remember spending one day at school taking a bag full of pills throughout the day, including six Diazepam, and honestly thinking I could collapse at any point and that would be it. My life had become a living hell. My mind was consumed by self harming, it had become a horrible ugly addiction. I was swarmed with cuts, bruises and burns. And despite how much i hated it, i just couldn't give it up. Nobody wanted to know me anymore, they ignored the issue entirely. I'd disappear from lessons constantly and no body would bat an eyelid. I'd been told time and time again it was just a phase, and that i'd snap out of it soon. I became old news, the shock factor had disappeared and it was easier to just sweep me under the carpet and forget about me than to try and tackle the issue. I somehow made it through school. I failed most of my exams due to poor attendance and just a general lack of caring. Suddenly I was being thrown in to college, with a new atmosphere and new people. What should have been exciting, was petrifying. 'How long until they notice my scars?' 'Will they judge me?' These two thoughts run through my mind whenever i meet somebody new. It's the thing i think of when going in to interviews, starting all three of my jobs, going on nights out, meeting people at parties, and recently when doing ear piercing at work. Fortunately i was in a group with some wonderful people, who were more mature and understanding. But despite being away from the people that treated me like dirt, i was still unhappy. I stopped cutting every day though and it slowly went down to 3 or 4 times a month. I saw the college counsellor and connexions advisor, but once again didn't feel any real benefit. It wasn't until leaving college and meeting many new people across the years, that i realised the judgement wasn't going anywhere. In school it was shrugged off as a phase, but at 21 it seems people are even more uncomfortable dealing with the issue of SH. It seems to be associated with younger adults and teenagers, as if it's something a more immature person would do. The worst is when it's addressed as attention seeking. Those two words put together are soul destroying to me. If somebody did feel the need to pick up a blade and drag it across their skin as a means to get attention, then whether they know it or not there is an underlying issue that needs to be dealt with. Regardless, for many self harmers, it's never about attention. It's not even a cry for help. It's just a way of coping, and getting through life. The reason i've told you all of this is because i strongly believe there needs to be a better understanding on the subject throughout the UK. Instead of shying away from it, we need to tackle it head on, and not just with teenagers. I'm 21 and i'm still cutting, but i am definitely not alone in this. Some people continue to SH their entire lives, can you imagine the years of abuse they might have received? I'm instantly treated differently at work when piercing ears when my arms get noticed. You can see peoples eyes darting to your arm, their trust in your abilities seems to be non existent.. all because of some scars. It's not a nice subject. I've purposely toned down what i've written, because otherwise it becomes nasty and uncomfortable to read. I rarely cut now, probably no more than 10 times last year. But my habit hasn't gone away, i still catch myself scratching my arm absentmindedly when i'm upset. I'm not trying to stop, it will hopefully happen on its own one day. But I am getting there, slowly. Other people aren't so lucky. Some don't make it through school. Some aren't offered any help at all. And it's not a hard stretch of the imagination to think that many are bullied a whole lot worse than i was. It kills me to think that there are 13 year olds like me, who one day make the decision to pick up a blade just like i did. To me, the whole point in raising awareness isn't about stopping SH. It's about educating those who aren't aware, or have judgemental opinions on the issue. Yes, you may not understand it, but it doesn't make someone any less of a human being. I am not an attention seeker, i'm not immature or less capable just because I deal with my feelings in a different way. If we can educate our children not to bully those who SH, and to offer help and guidance instead, i'd like to think many will find the strength to stop before it consumes their lives. If our teachers are more aware, and know the signs to look out for, they can be more prepared to handle it and help students cope. I don't think you should ever tell someone who injures themselves to stop, it simply isn't that easy. But to offer a shoulder to cry on, alternatives to cutting, or even advise on how to cut safely (I know this sounds weird, but keeping blades clean and disinfected can help prevent infections), can all help. I'm sorry for rambling on so much, and i'm sorry if my train of thought jumps in places or it wasn't a particularly nice post to read. I'm just so involved with the subject, and charities helping those who SH that I really just wanted to say something. I shouldn't have to be ashamed to have scars on my arm. They are proof that i've gotten through all the negativity in my life, that i didn't just give up when it's all i wanted to do. I'm still a person, and i refuse to be treated any differently because of a choice i made when i was 13. If anybody has anything to ask me, i am more than happy to answer you. In the past couple of years i've found it a lot easier to be honest and truthful about my SH. I'd much rather have somebody ask me about my scars than stare at them, or just refuse to give me the time of day. I really hope that if you've read this that you explore some sites dedicated to other peoples stories, or websites put together to offer help to those who want to stop, or have a loved one who cuts and need advice and guidance. I'm not glorifying self harm, but i'm not ashamed of it either. If you can help prevent someone from starting in the first place, that's the best victory you could hope for. I think i'm going to leave it there, because that's a whole load to take in. Thank you again for anyone who reads this, i hope i haven't offended/shocked anyone. Thank you so so much for sharing your story. It's well-written and open and enlightening, and I'm glad you're doing better despite that lack of support. I'm lucky to have had minimal experience of SH, but as a teenager who sleepwalked through school with obvious yet undiagnosed depression, a lot of your story feels very familiar. The "attention-seeking" rubbish can be a huge barrier to fighting mental illness - I don't know about you but I internalised all these things people said and believed them. As if being unwell to the point of self harm or having suicidal faults somehow isn't serious! Thanks for sharing and getting awareness out there. You did a great job writing. Stay strong and love yourself. *hugs* That was very brave, thank you for sharing. 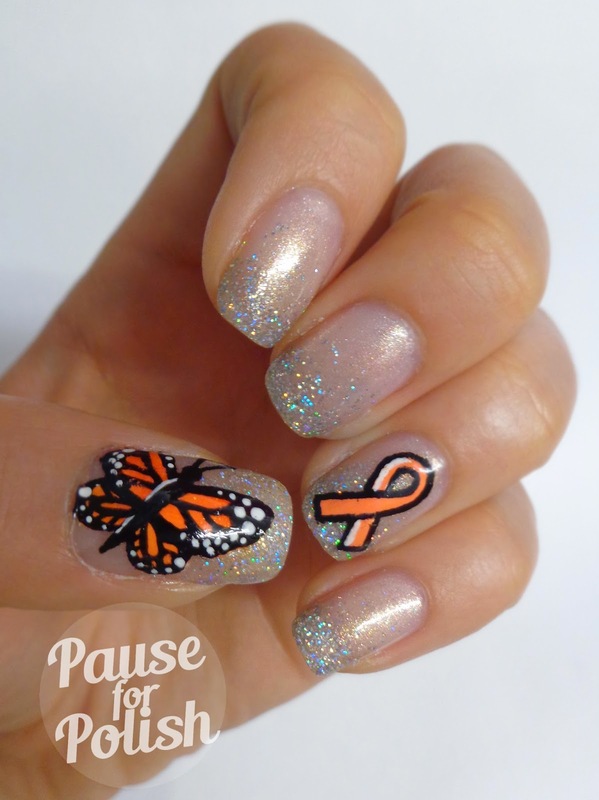 And your mani... lovely glitter gradient and that butterfly is gorgeous! I'm sorry you had to go through all of that with so little support. So glad you're able to share and possibly help others in the same situation.